As far as handset vendors go, Huawei holds special importance to me. Their devices were among the first that I ever reviewed here on AnandTech, and the Mate series has been one that I’ve personally watched while it has evolved over the years. 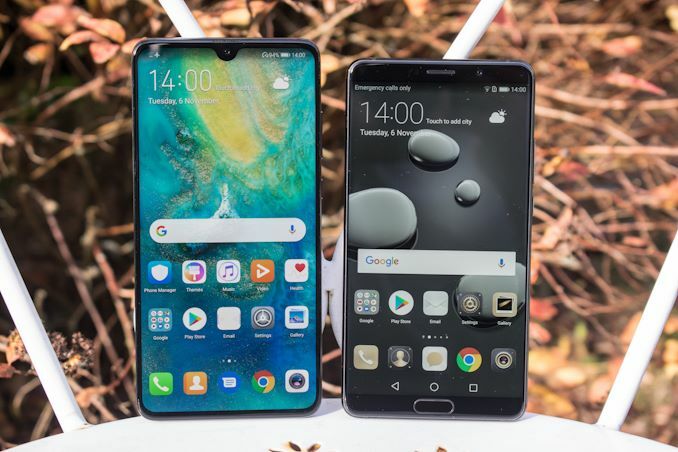 There’s been ups and downs in their products, but Huawei always showed a consistent amount of progress with each generation, raising the quality of the product, inching ever closer to making themselves a household name among smartphone vendors. Today Huawei has surpassed Apple to being the #2 smartphone vendor worldwide, achieving a goal that they had presented as a strategy as early as back in 2015. Yet the company achieved this goal while facing huge struggles in the US market last year – to the point where now they are no longer actively trying to compete. When asked what the company’s strategy for the future were, the answer was relatively simple – make devices that were good enough that they naturally create user demand for them. The Mate 20 and Mate 20 Pro are Huawei’s latest attempts to push the envelope in terms of creating symbolic flagship devices. In this review, we’ll go over all the aspects of the two new phones – and see if Huawei has managed to create something that is worth of your purchase. At the heart of both new flagships, we find Huawei’s new Kirin 980 chipset. Huawei is the only Android manufacturer that is able to take advantage of full vertical integration of silicon and handsets. The new Kirin 980 is an important chipset as it’ll power all of Huawei and Honor’s flagship devices for the rest of 2018 and 2019 - at least until the next generation is revealed. The Kirin 980 isn’t only important because of its use in Huawei’s own devices, but also because it’s the very first Arm Cortex-A76-based and Android-compatible 7nm SoC on the market. This means that whatever the new Kirin 980 brings to the table in terms of performance and power efficiency, will be largely representative of nearly all upcoming Android devices in 2019. The Kirin 980 sports four Arm Cortex-A76’s – with a pair of them clocked in at 2.6GHz and another pair clocked at 1.92GHz. Accompanying them are four Cortex-A55 cores at up to 1.8GHz. To round off the CPU complex, the chipset is also the first to introduce Arm’s new Mali G76 GPU in a MP10 configuration running at up to 720MHz. We’ll be detailing the SoC in more depth in a dedicated page after we talk more about the design of the phones themselves. Starting off with the “standard” Mate 20, we see quite a significant design shift from last year’s Mate 10. The Mate 10 was a bit of an odd device design wise, as Huawei had opted to put a fingerprint sensor on the bottom front of the phone, even though previous Mate phones as well as its sibling the Mate 10 Pro also had it on the back. The Mate 20 now goes back to a more “traditionally” located back fingerprint sensor, and also adopts the trend of having a near bezel-less design, sporting a very large 6.53” 18.7:9 2244 x 1080 LCD screen. 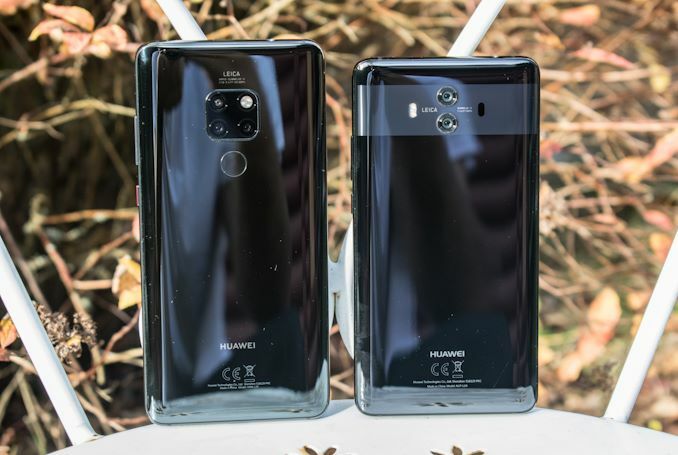 What I find most important about the new phone (that isn’t obviously showcased in the pictures) is the fact that the Mate 20 is ever so slightly narrower than the Mate 10, now coming in at a width of 77.2mm. 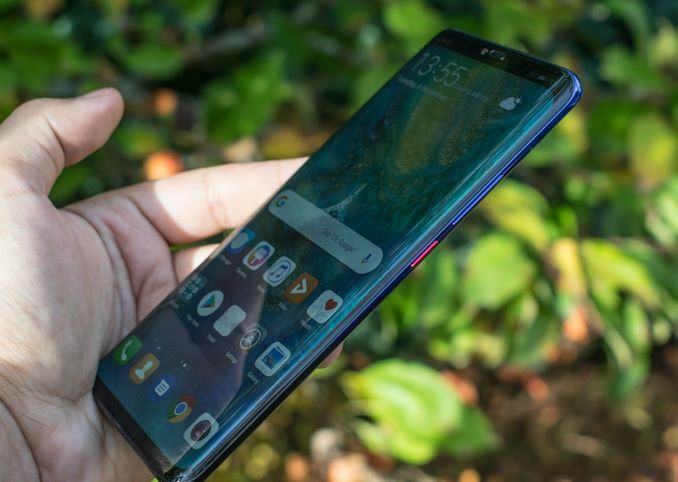 The few millimetres of reduced width doesn’t seem much, but it makes a huge difference in terms of usability, and I vastly prefer the Mate 20’s new slimmer and more elongated form-factor. When looking at the Mate 20 Pro against the Mate 10 Pro – we see an even more significant design shift. The new Mate 20 Pro can only be described as Huawei taking note of Samsung’s Galaxy S8/S9 designs, as the new phone marks a striking resemblance in terms of the features that defined the ergonomics of Samsung’s phones. The Mate 20 Pro is thus Huawei’s first phone adopting a curved screen as well as a curved back. The screen is an OLED, coming in at a diameter of 6.39” and is also finally Huawei’s first phone to push beyond 1080p – coming with a 3120 x 1440 panel with a very elongated aspect ratio of 19.5:9. 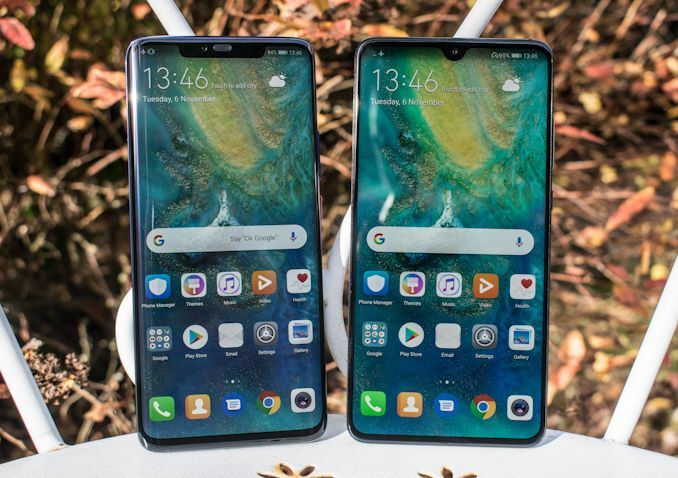 Similarly to the Mate 20, the Mate 20 Pro also slightly reduces the width of the phone from its predecessor, the Mate 10 Pro. The new unit is now 72.3mm wide, making it a little over a millimetre narrower than a Galaxy S9+. Combined with the new curved display and curved back, this creates an in-hand feel that is significantly more comfortable than any past Huawei device that I’ve come to use – and for me personally this is also as near to a perfect form-factor that I’ve encountered. What really stood out for me is the build quality of the Mate 20 Pro. This is by far Huawei’s best built phone, as it just feels incredibly solid while keeping a flowing design on all its sides. I think the fact that Huawei doesn’t use a seal ring around the display glass is what gives the phone an edge in terms of feeling. 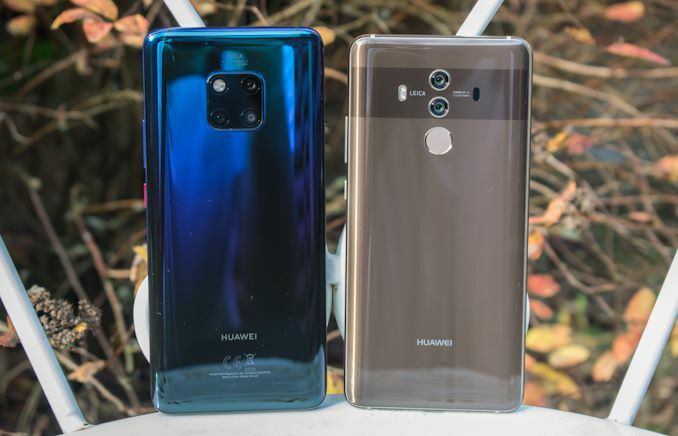 Overall it’s very obvious that Huawei took design inspirations from Samsung here – but I absolutely don’t blame them for it, as imitation is the best form of flattery, and Huawei executed the ergonomics perfectly on the Mate 20 Pro. Both the Mate 20 and Mate 20 Pro’s displays continue with the trend of using display notches. 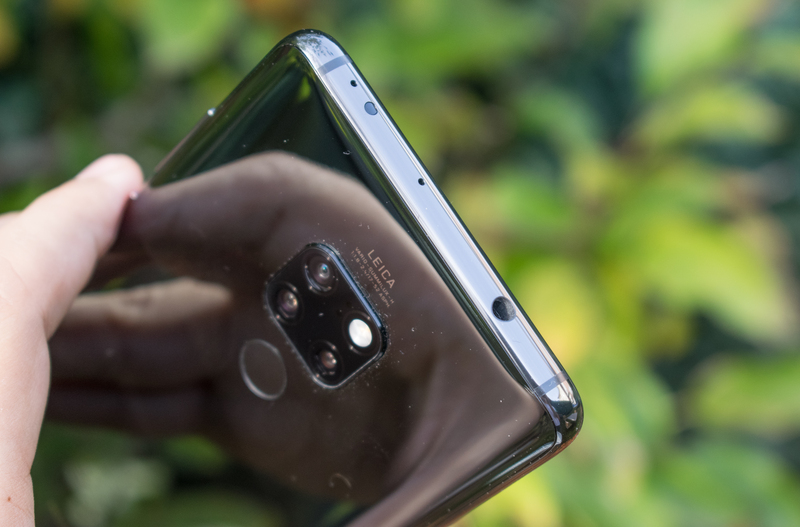 The Mate 20 uses a new minimalistic “tear drop” notch design that houses the front camera as well as hides the front sensors just above and left of the camera lens, along with the earpiece grill above them all. I’ve never really had issues with Huawei’s notches (As reviewed on the P20 and P20 Pro), and the Mate 20’s new design also didn’t bother me much. As is usual, Huawei’s software is still able to black out the notification bar in order to hide the notch, and I had this enabled in daily usage. The Mate 20 Pro’s notch on the other hand, is something of a first for Android phones. Here Huawei is very much taking note of Apple’s iPhone X/XS notch – not only in terms of design, but also in terms of actual functionality. The new wider notch houses three new sensors/modules: A dot projector, a flood illuminator, as well as an IR camera. This enables the Mate 20 Pro to sport essentially the same fast, reliable and secure face unlocking methodology as Apple’s FaceID. The wider notch unfortunately did come as a compromise, as it’s at this point that I thought the notification bar lacked enough space to show the more relevant status icons, and the OS will overflow status icons to the left “ear”, which is usually dedicated to notification icons. I’m not a big user of face unlocking, but Huawei’s implementation looks to be seamless, fast and reliable. The big surprise for the Mate 20 Pro is that featuring face unlocking is not a replacement for fingerprint unlocking, but rather just an option. You might have noticed that there’s no fingerprint sensor on the back, and that’s because the Mate 20 Pro houses it under the screen on the front of the phone. Again, the implementation is good in terms of unlocking reliability and accuracy, although I would had hoped it would be just a tad faster. Also what I feel is missing is some better (or any) haptic feedback when using the sensor. If you chose not to use the fingerprint sensor or fall back to a regular passcode unlock method, it also becomes sort of a waste – here I would have hoped Huawei would at least use it as regular button in the same way that Samsung does on the S8 and S9. On the bottom of the phones, there’s a surprising lack of a speaker grill on the Mate 20 Pro. Here the sound comes out of the USB-C port, which is very weird. Plugging a cable obviously muffles the sound significantly, so don’t expect to play back music while charging the phone to be something viable. Also on the bottom we find the SIM tray and microphones. On the Mate 20, we do find the speaker grill, however the phone is only IP53 certified, as opposed to the IP68 rating of the Mate 20 Pro. Unfortunately this is the only speaker on the Mate 20, as the earpiece doesn’t serve as a stereo tweeter. The SIM tray on the Mate 20 is relegated to the left side of the phone. One thing the Mate 20 does have that the Mate 20 Pro doesn’t is a 3.5mm headphone jack. Again Huawei’s decision to give the regular model a jack while removing it from the Pro model just perplexes me – again a situation where a vendor tries to portray the removal of a feature as some kind of benefit. Both Mate 20 and Mate 20 Pro still come with an IR transmitter on the top of the phones, able to control various appliances with it. 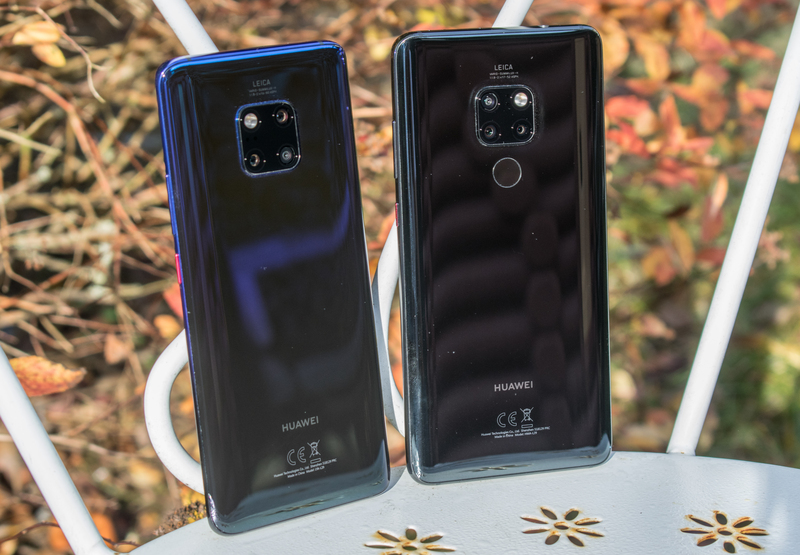 Finally, the centre-piece on the back of both phones are the cameras: The Mate 20’s are along with the V40 one of the rare new generation of devices which feature the trifecta of wide-angle, regular, as well as telephoto camera modules. Huawei houses these in a square design layout, along with the flash LED inside the fourth cut-out. Huawei wanted this design to be unique to them, and something that would be instantly recognisable and attributed to the company’s devices. The camera hardware itself is quite a specification mess, as the two phones don’t share a single module between them. The Mate 20 features a 12MP main camera with an f/1.8 aperture, alongside a 2x optical zoom 8MP f/2.4 module, and a 16MP f/2.2 wide angle unit. 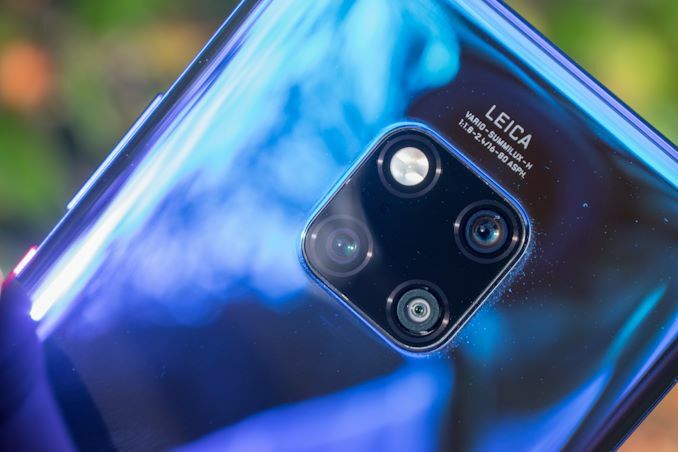 The Mate 20 Pro’s camera configuration is more familiar, as the 40MP f/1.8 main camera as well as the 3x optical zoom 8MP f/2.4 module look to be identical to the ones found in the P20 Pro – here the addition is the new 20MP f/2.2 wide angle module. We’ll be going into more depth about the camera in the dedicated section later in this review. 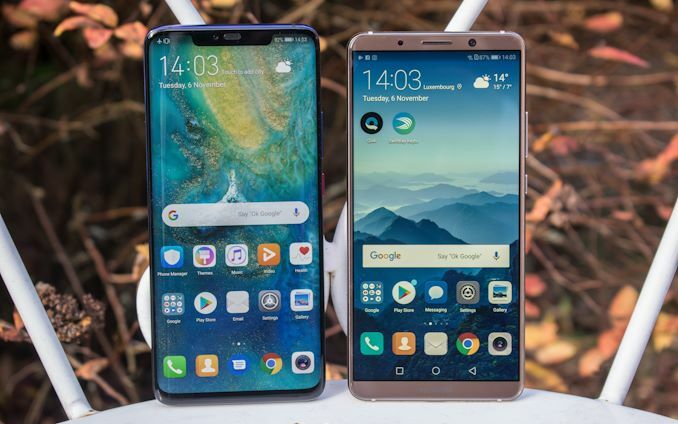 Overall, the Mate 20 and Mate 20 Pro both a represent quite a design shift from Huawei and do promise a slew of features. Build quality is definitely a plus of the new devices, especially for the Mate 20 Pro. Moving on to the internals of the devices, we’ll inspect in more detail the new generation hardware of both phones to see if they live up to their promises.